So there I was, sitting in my office listening in on a teleconference with my bike parked less than a metre behind me... BANG! Scared the hell out of me, and had co-workers coming to see what blew up. We assumed it was one of the heat pumps in the ceiling above my office. 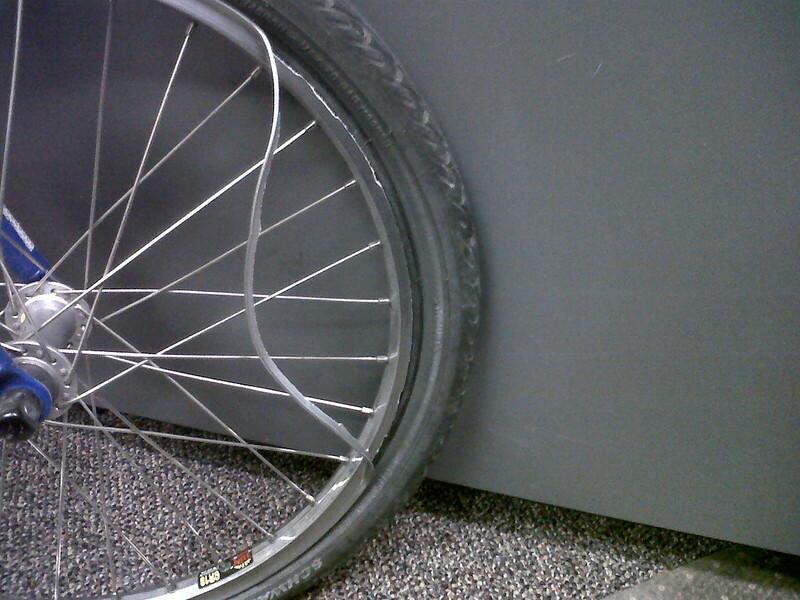 While the building maintenance people were here to check on the pumps, I noticed what happened to my wheel. We had a good laugh about that unexpected discovery. So, lesson learned: Check your rims for wear from the brakes. If you can feel a groove, it's probably time to replace the rim. I knew this, but never got around to doing it. In fact, the rear wheel of this bike did the same thing a few years ago, but I caught it in time before there was any catastrophic failure.